Kirk, Knight of Thorns, is an NPC that will invade the Chosen Undead three times through their journey. His barbed equipment are his trademark and the source of his title as the Knight of Thorns. First, Kirk will invade in the Depths. Later, in the Demon Ruins, and finally, in Lost Izalith. If he's defeated in these three occasions, his corpse will appear near the Fair Lady. 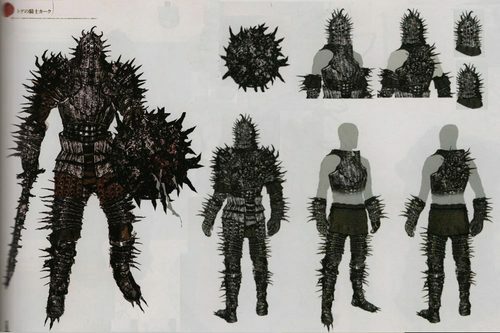 The Set of Thorns he wears describes him as a "notorious member of the Darkwraiths". 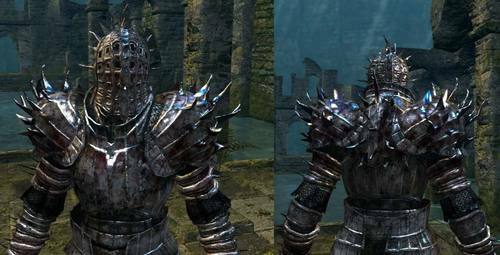 His Barbed Straight Sword describes him as "the infamous Darkwraith Kirk, also known as the Knight of Thorns for the gnarly spikes on his favorite weapon". Miyazaki: Ah, I was quite rude about the first design that reached me, I apologise. Originally I asked for something like Hydra from Saint Seiya. I like the poignancy of that character, to have gone through such harsh training to earn his holy armour, and after all that, his special ability amounts to nothing more than some claws attached to his hands. You would be pretty crestfallen, wouldn't you? The design only began to take shape when we started talking about the trial of the 77 rings from Jojo's Bizarre Adventure. In the first part of the manga there are two characters called Tarkus and Bruford, who, in order to earn their knighthood have to overcome the trial of the 77 rings. Each combatant wears a metal ring, the winner taking the loser's and adding it to his own. They have to defeat 77 opponents, but with each victory the number of rings they are forced to carry increases. It's a really cool idea, so we started talking about what it would be like to attach thorns to those rings. The final design was slightly different, but that's where it really started coming together. Miyazaki: The guy with the thorns; Kirk, is a member of the Chaos Servants, and he’s trying to rob humanity for the Fair Lady. If you kill him for the last time, his corpse will appear near the eggs, and you can loot it. Miyazaki: Yes, that’s the reason of why he's dead there. According to item descriptions of his sword and armour, he is an infamous, notorious Darkwraith, however the placement of his corpse, the places where he invades and the fragment from the Game no Shokutaku interview practically confirm that Kirk may have abandoned the Darkwraith covenant upon discovering the Fair Lady, and started collecting humanity for her. Nonetheless, others theorise that this contradicts his infamous and notorious nature, and point him to be actually willing to kill the Fair Lady in the same way Lautrec of Carim does with Anastacia of Astora for her Firekeeper Soul. 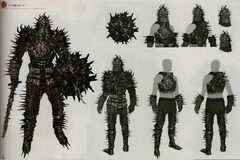 Set of Thorns Armor of Kirk, knight of Thorns and notorious member of the Darkwraiths. A dense patch of thorns grows from its surface. It is a fitting item for the murderous Kirk, for by simply wearing it and rolling, one can damage enemies. Barbed Straight Sword The choice weapon of the infamous Darkwraith Kirk, also known as the Knight of Thorns for the gnarly spikes on his favorite weapon. This frightful sword deals only thrust attacks, and causes heavy bleeding. Spiked Shield Shield of the infamous Darkwraith Kirk, Knight of Thorns, covered with spikes. Can be used as a weapon. Sharp spikes cause heavy bleeding.